Jennifer Stewart is Living Liberty, the original Statue of Liberty lookalike performer! 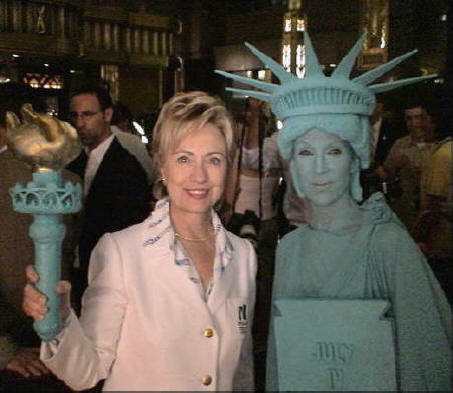 Internationally known as the original Statue of Liberty look-alike, Jennifer Stewart won the National Statue of Liberty Centennial Look-Alike Contest in 1986 when she beat out 1,000 contestants nationwide and was crowned national winner during a live broadcast of the CBS Morning News on July 1, 1986. Stewart's been green ever since! 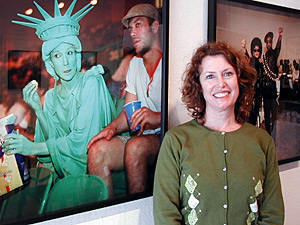 With her compellingly authentic rendition as a "living" Statue of Liberty, Stewart has mesmerized huddled masses the world-over in such far-off locations as: Brazil · Argentina · Singapore · Japan · Monte Carlo · Bermuda · Dublin · London · Hawaii · Canada · Alaska, and throughout the United States from sea to shining sea. Also appearing in popular media, Living Liberty has been featured in major motion pictures, such as Joe Versus the Volcano with Tom Hanks and Meg Ryan; and is currently highlighted in Pulitzer Prize nominee Greta Pratt's new book, USING HISTORY. Photographer Greta Pratt with Living Liberty photo from her book, "Using History". Don't be fooled by mere imitators! There's more to being a monumental icon than looking like a statue! Embodying the essence of what one would expect from a "living" Lady Liberty, Stewart will captivate and delight your guests with her gifted Living Liberty performance. So take the liberty to contact Living Liberty today! And turn your next convention, trade show, advertising campaign, private party, fundraiser, film/photo shoot, or meeting into a monumental success!